Get the Rare Genomics Free 150 Page Rare Diseases E-Book: Rare Diseases – Diagnosis, Therapies and Hope. Once you have entered your email a download link will appear below. Thanks for your Interest in Rare Genomics Institute Free Rare Disease E-book. This is a free e-book on rare diseases written in a way that is easily accessible for all audiences. Ten case studies about breakthrough discoveries for rare disease patients. Many interviews with top doctors, researchers, and genomics experts. A Rare Disease Parent’s Toolkit with recommendations from parents and others. Demystifying Genomics, which explains in simple terms the latest developments in rare disease treatment and research, including information on how the sequencing process works. 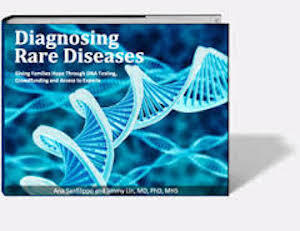 This book includes almost everything in the book Rare Diseases: Diagnosis, Therapies and, Hope plus 40 pages of additional information on how the Rare Genomics Institute (RGI) helps patients connect with top scientists, receive crowdfunding donations, and pursue genomic sequencing.